A year ago I backed a small Kickstarter project by CMON. It did well enough and even shipped in what I would consider to be a reasonable time, for a Kickstarter. It arrived when I was on vacation in July. Although I was excited to begin painting the miniatures I was in the middle of painting some Guildball Fishermen which I had received this past Christmas. Sticking with my goal of painting all purchased miniatures before starting more I finished the Fishermen so that August 21st was the first day I applied brush to miniature. 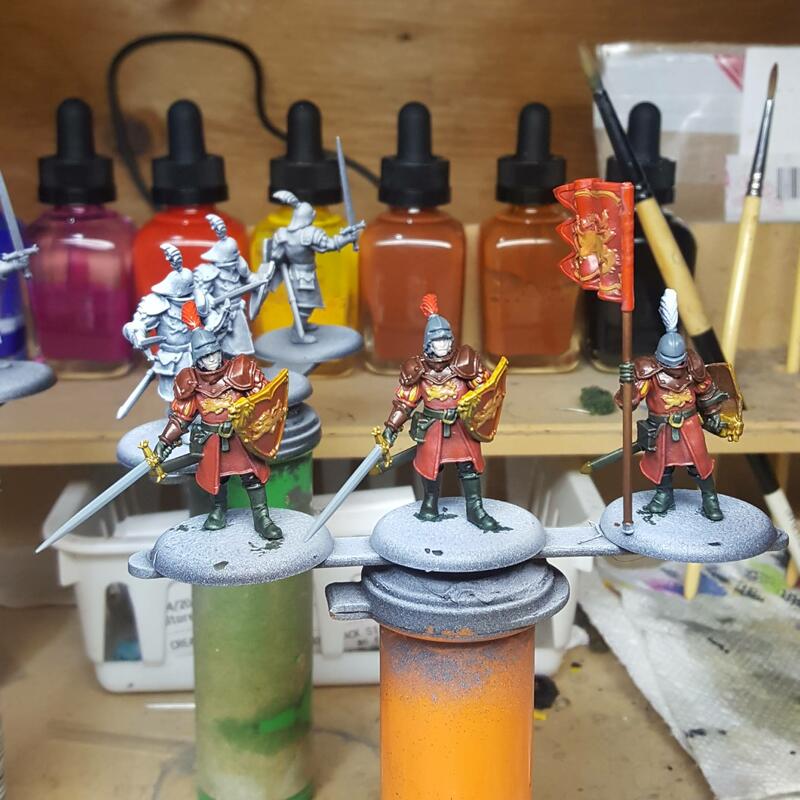 The first three Lannister Guardsmen are Flatted. Do not ask me what made me choose the Lannisters first. I am a Stark by nature and if I were to pick an army to complete for this game it will be a Stark army. None-the-less the Lannisters were the first prepped and so I have begun. I have not fully decided on the painting order for the A Song of Ice and Fire core set. I can either paint all of the Lannisters first and then the Starks, or I can alternate unit by unit. Additionally I need to decide if I want to paint all the units and then all the leaders, or use the leaders as rewards for painting units. The answer to both questions is how I want to balance momentum and motivation. On one hand if I stick with Lannister units I am painting similar miniatures using a similar technique. Lannister attachments and commanders would be painted in a somewhat higher quality, requiring a change of technique which will invariable reduce my speed. Switching to Starks would have a similar if not more pronounced effect. Meanwhile, painting only ranks upon ranks of infantry might become tiresome and boring which would also slow me down. However, much like taking a decision out of your hands often reveals your preference describing my two options is pushing me towards momentum over monotony. The thought of switching gears and losing momentum is more distressing than the thought of painting the same unit multiple times. How about you? Do you prefer to get everything done in big batches or do you need to break up projects to avoid burn out? Let me know in the comments.